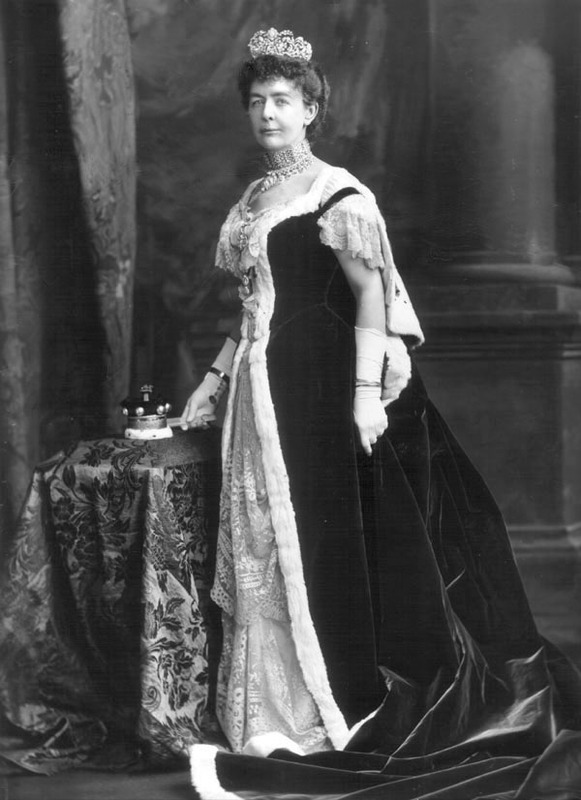 Lady Conyers, née Mary Curteis (d 1921). Sitter: Lady Conyers, n�e Mary Curteis (d 1921). Biog: Daughter of Reginald Curteis, of Windmill Hill; m. 1860 Sackville George, 12th Baron Conyers; mother of Marcia Amelia Mary, Countess of Yarborough and 13th Baroness Fauconberg & Conyers. Costume Supplier: Paquin Ltd., 39, Dover Street, London W.
Furniture & Props: A painted backdrop. Costume Supplier: The Court Journal, 16 August 1902, p 24a. Reproduced: [version] The Gentlewoman, 8 April 1911, p 459. 1. with "...a pretty front of mousseline de soie and lace" (The Queen, 16 August 1902, p 257b).